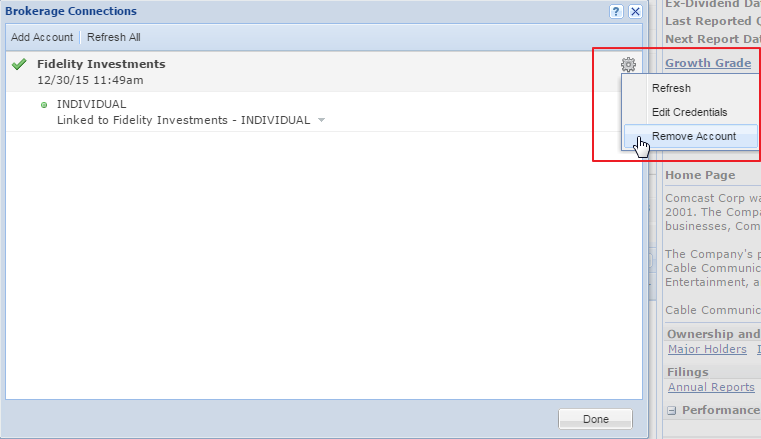 To remove a brokerage account completely from Stock Rover, go to the Brokerage Connections panel and use the gear icon for the option to ‘Remove Account’ as shown below. You will be prompted to confirm this action. Once you have removed an account, all Stock Rover portfolios linked to the account will remain intact, but they will no longer be linked to any brokerage and will no longer receive automatic updates. If you want to remove a single portfolio from your brokerage but not a whole account, hover over that portfolio in the Brokerage Connections panel for a gear icon. Click the gear icon and select ‘Delete.’ You will be prompted to confirm that you wish to delete the portfolio.